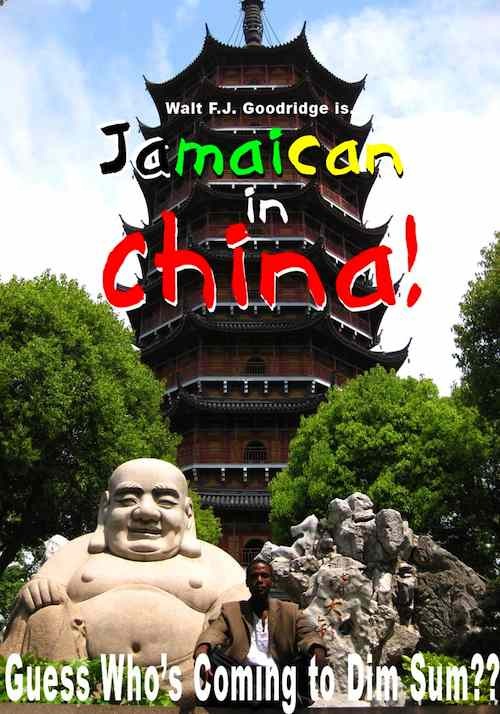 cost of living | Jamaican in China…..and beyond! 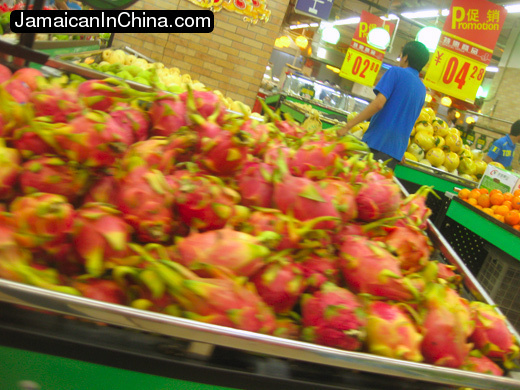 All the produce in China is priced per 500g. 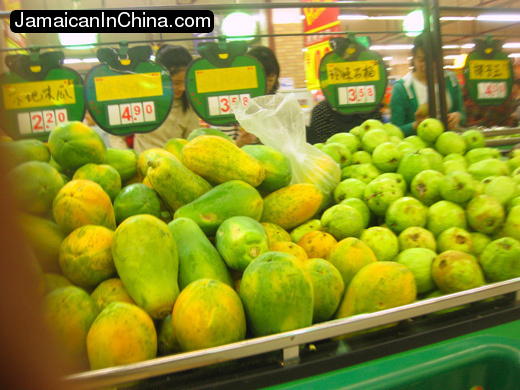 So, when you see a sign announcing 2.20RMB for a papaya, it actually means 2.20RMB/500g, or 4.40RMB/kg. Now, then, I’ve figured out why they do that–it’s to confuse the tourists! No, really. I can prove it. Most tourists, say an American (or a Jamaican who used to live in New York), thinks in terms of pounds. 1kg is actually 2 lbs, so when I see 2.20RMB, I think it’s 2.20RMB per pound, but it’s not. 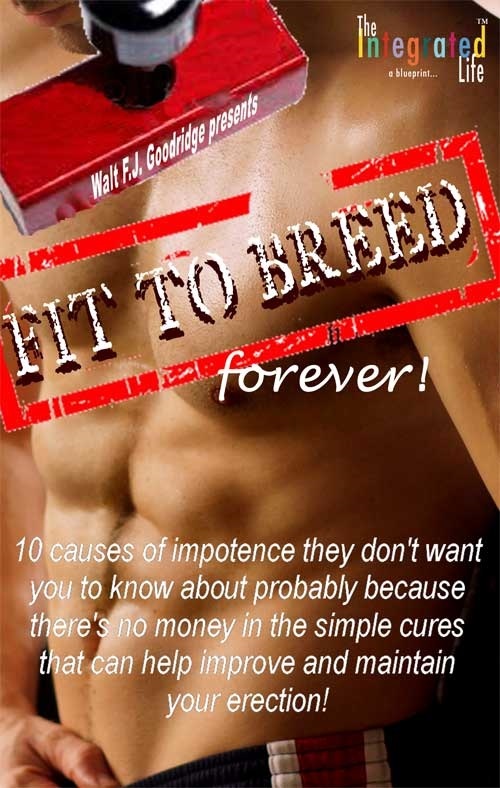 That’s confusing enough, but here’s where the trick comes in. The street vendors who sell produce use an entirely different system of computing prices. It’s called “free market, mood-based opportunity capitalism.” In other words, they charge by the pound, gram, kilogram, weather, nationality of the purchaser, color of your shirt, or day of the week, it really could be anything, depending on mood of the seller. 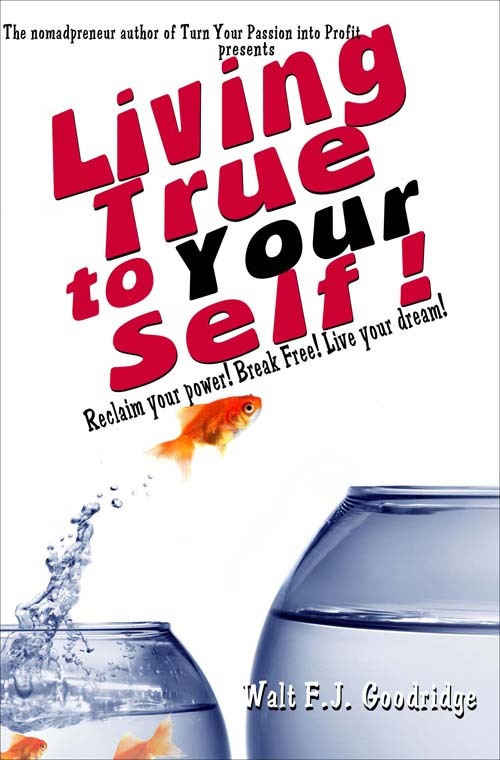 In 2009, when I visited China for the first time, I walked into a shop in Shanghai–within about an hour of landing at the airport–to buy a small 250ml bottle of water and asked the price. Storekeeper told me 2RMB. Now I know enough to know it should be no more than 1RMB, or perhaps I was simply sensing intuitively that “the game” was on. I stepped out of the shop, called my translator in (at the time, I was traveling with Chun Yu Wang, author of Chicken Feathers and Garlic Skin,) and had her ask the price. She’s Chinese. 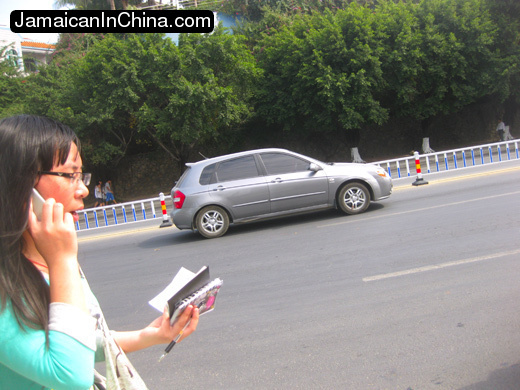 Caught in the act, the owner shyly admitted to her it was 1.00RMB. We all laughed at his obvious, failed attempt to play and win the game. On another day, in Wuxi, I walked into a store to get a bag of cashews (7.50 RMB) and a bag of dried fruit (12.00RMB) with prices plainly written on the items. The shop cashier/owner punched in the prices in a calculator (she didn’t use the scanner like she did the day before), turned the small screen toward me indicating that my bill was 30RMB. Ahem. Now, I may not speak Mandarin, lady, but I went to school to be a civil engineer. We covered basic addition. First day, even. Heck, I can even do that one in my head. I took the calculator, silently punched in the numbers myself, turned the small screen back toward her showing her I would be paying 19.50 RMB. She waved her hand in disdain, took the 20RMB bill, gave me my .50 RMB change–all this in a wordless exchange of calculator buttons, bills and screen displays. 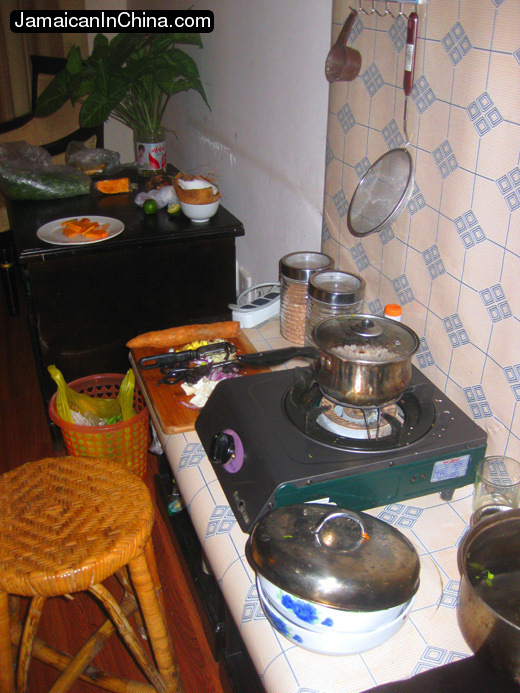 You might have already read my tale of The Greedy Innkeeper In Xishuangbanna. Around the corner from the Lost Hostel here in Sanya, there’s a vendor selling fruit. Asking price for a small papaya? 20RMB. 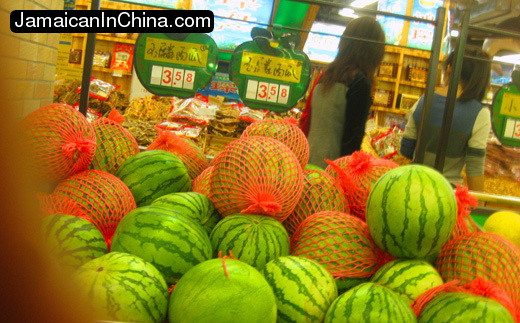 Now, I shop at the supermarket in the city centre, so I know that a small papaya costs about 5RMB. I laughed and walked away. The next day, as I returned from shopping, I decided I wanted a mango. I knew about what it should cost from my supermarket shopping experience. So, I walked towards Mr. Papaya’s stand, and fortunately, at the same time, there was a Chinese woman also buying mangos. So, sensing my own opportunity, I pretended to browse a little longer, delaying my purchase, lingering for a bit to give the lady a chance to select her mangos and pay for them. 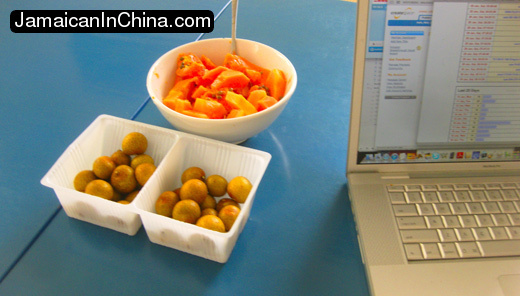 Then, I watched the screen of the electronic scale carefully, and noted that Mr. Papaya punched in 17RMB/kg for her mangos. (A day or two before, he had entered 29 for my mangos.) So, now that he had her mangos on the scale and told her the price, I approached him at the scale. 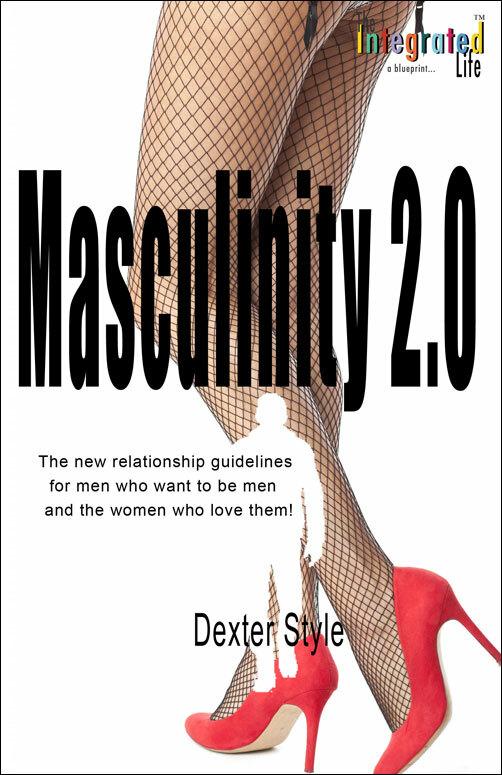 He knew that I had seen the price per kilogram that he had punched in for her. I knew that HE knew that I saw the price per kilogram that he had punched in for her. So, perhaps to avoid embarrasment, he had no choice but to give me the mangos at the same price. I could be mistaken, but he didn’t seem happy, though. I paid 15RMB for my two mangos (about what I would pay at the supermarket). He gave me my fruits and said “goodbye,” (An unusual thing for him to say, actually. I’ve never had anyone tell me goodbye before. Guess he wanted me to say “goodbye,” too (in other words. leave!) before I discovered the Chinese prices for everything on his stand! I imagine that some people would have paid Mr. Papaya the 20RMB for various reasons:(1) to avoid a scene because they dislike confrontation, (2) Feeling ill-equipped to communicate effectively if there’s a language barrier, (3) It’s still cheap given the conversion rate to their native currency, and (4) perhaps other reasons I simply can’t relate to. 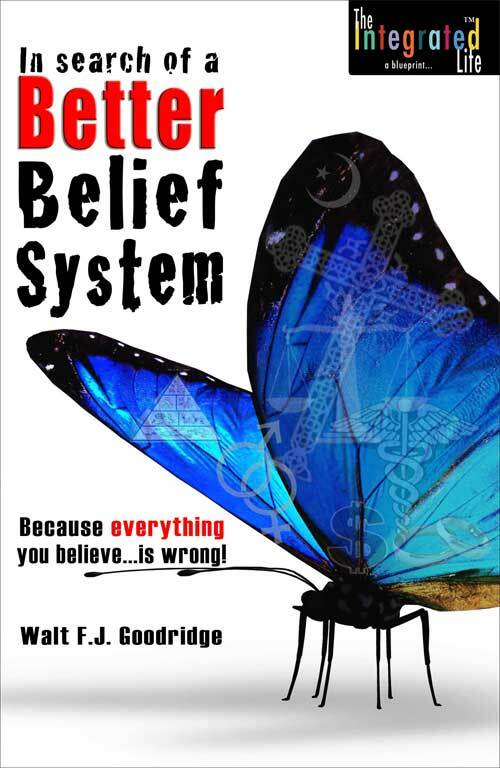 However, there’s just something in me that won’t allow me to willingly pay for something when I know the price is being inflated simply out of what I perceive to be opportunism based on a stereotype of the unaware, easily-manipulated, easy-target foreigner. 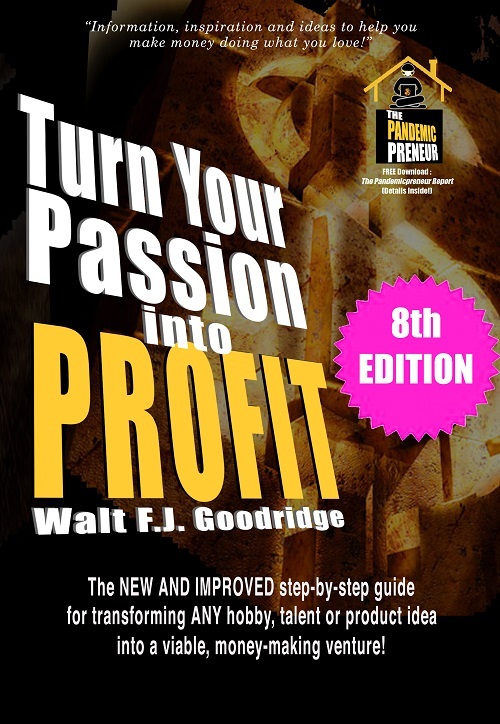 It’s a way of business I’ve seen in many places–different prices for different customers. 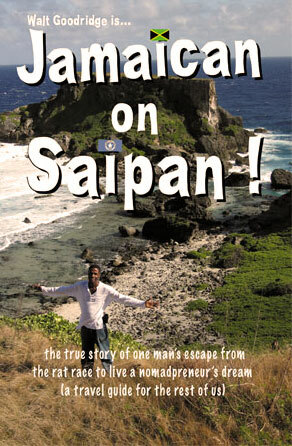 It’s done in the tourism business on Saipan. It’s done in Laos, and everyone who travels has likely experienced it to some degree. 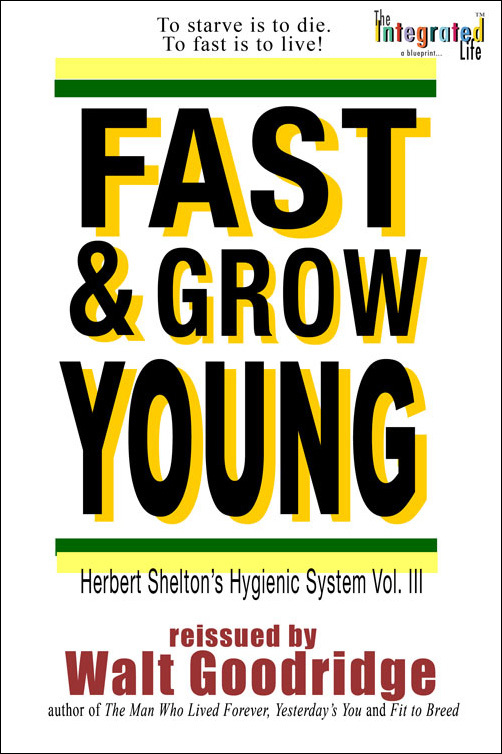 Business is about seizing the opportunity to get the most you can get at any and every given moment. The cost is variable and based not on any pre-determined intrinsic or objective value, but the ability and willingness (unwitting or otherwise) of the consumer to pay. 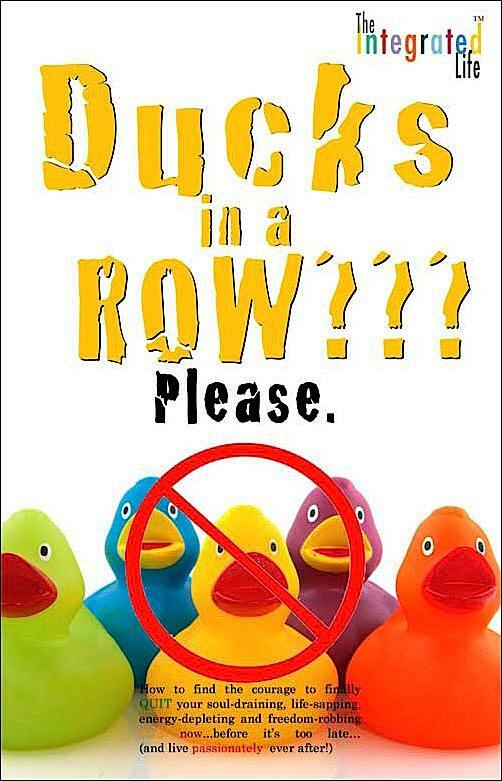 Now, maybe I’m being too forgiving, but I’ m not mad at the people who practice “opportunity marketing.” You know, In some ways, it’s no different from a hair stylist charging John Edwards $400 for a haircut. Yes, it’s a bit stressful for me, since I already hate shopping. 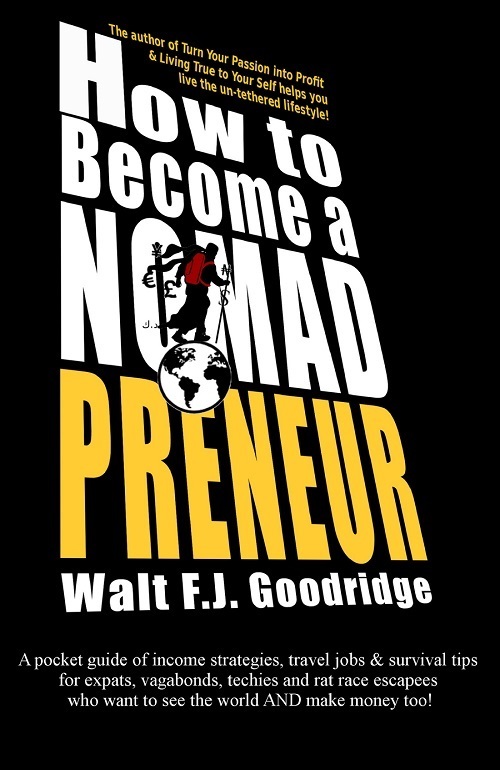 But, I don’t want to impose an outsider’s standard of how business should be done. But, I’d like to hear what YOU think. “hey Walt,I read the news last night. People are complaining to the media that the whole tourist industry of Hainan is taking advantage of the Spring festival (Chinese New Year). The local Chinese government official commented: “This is normal.” (that is, no big deal. Don’t fuss.) Now you see why people say the Chinese capitalism is actually more real than the western one. 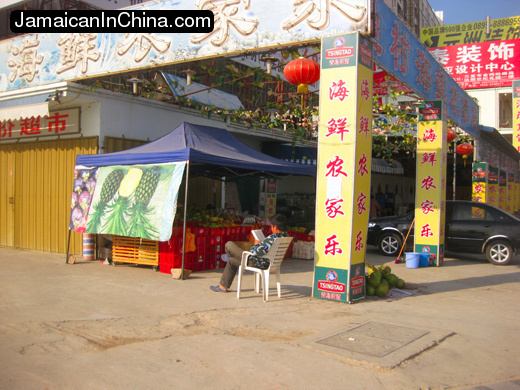 It occurs to me, as I enjoy my 5RMB supermarket-bought papaya here in Hainan, that my friend Jian is right! First of all, thank you for the support of all who emailed me about my last post. Apparently, my dramatic writing flair was better than I expected, or perhaps my friends are accustomed to the drama I often welcome into my life. 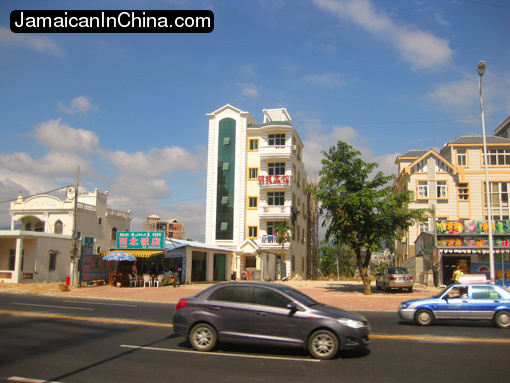 In any event, to set things straight: I am not going to be homeless on Hainan! 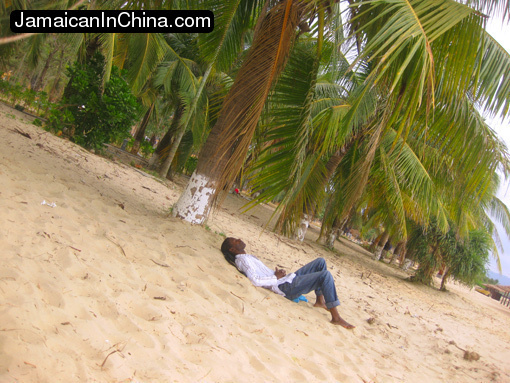 I repeat, I am not going to be homeless on Hainan! So Fret not thyself, and stop sending out thoughts of worry and despair–you’re killin’ my buzz! However, you can still send any money you’d like to send if it makes you feel better to do so. Perhaps I forgot to mention that there are ALWAYS other options, and, while I said I’m not above sleeping on the beach, I’m also not above paying extra if it’s practical. There are no electrical outlets on the beach for my laptop. So, let me tell you what happened! 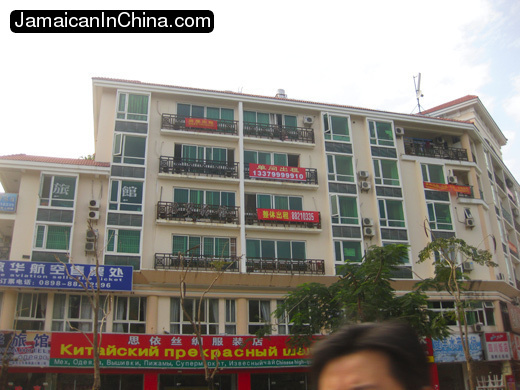 In our last episode, I told you the tale of the Hainan heist, the hotel that charged me 60RMB/night and then proceeded to raise the price once I was there. Well, To paraphrase Country singers Garth Brooks (as well as Mark Chestnutt for those who think I don’t know Country), I have friends in high places, low places, and other-worldly extra-dimensional spaces who keep me grounded, guided and gifted with great advice and support. A good friend back in the states suggested that I have a Chinese friend check in with me, and tell them that they have to honor their contract with me, or otherwise they could lose their license. He suggested that I tell them I’ll call the police – since I have a receipt of sale to prove it. My friend also thinks I didn’t take advantage of “Junior,” and I agree, since it’s unlikely that Mom and Dad would entrust that responsibility to him unless he knew how to handle it. I also sent an email to some of my friends across China, and here are some of the responses I received. Essentially, my Chinese friends, agreed to seek a compromise. “What I would do is tell them that you will take all evidence (receipts, anything they wrote, pictures of signs showing prices, etc.) and file a complaint to the Sanya Bureau of Business Administration （工商局） and Bureau of Tourism (旅游局), but at the same time trying to negotiate a price a bit higher than what promised by the “Junior” but lower than the market. I believe they will be happy to do so. my friend, Jian, call the owner on my behalf. 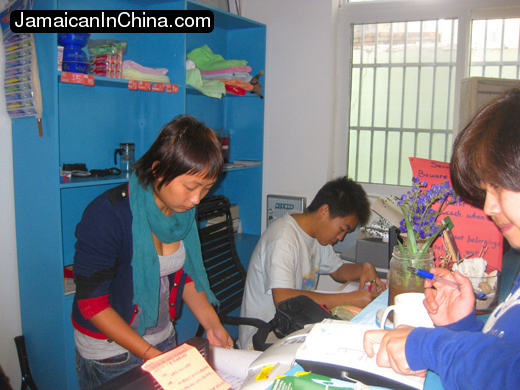 Here were my terms: Having already agreed to pay 60RMB/night, I told him (to relay to her) that I would be willing to pay 90RMB or 100RMB. In other words, it would have to be LESS than the 150RMB/day that my “Plan B” hotel down the street was going to charge, and furthermore, it would have to be LESS than double the current price (2 x 60=120RMB), since 120RMB/day was what I was paying at the youth hostel for a room in a better neighborhood that included internet access. Jian called her this morning, (new year’s eve) and without resorting to threatening to get the authorities involved, she agreed to 100RMB/day for a ten day stay. 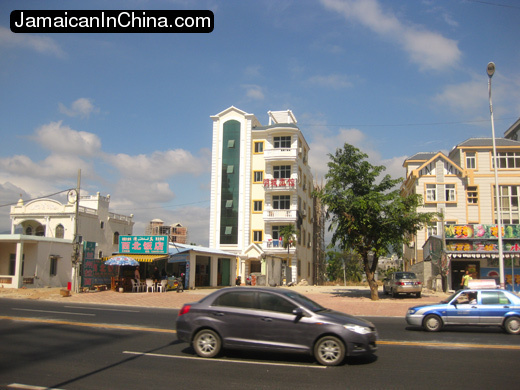 So, I’ll get through the high season on Hainan paying 100RMB/day which is still effectively less than the 116RMB/day that the 3,500RMB/MONTH apartment with the shared kitchen in the other side of town was asking. I’m sure the owner is a bit happier. Me? Well, for various reasons, including the fact that I’m in China, (and since the owner has access to my room), I’m content with taking the middle ground. Even though a few friends with US mindsets also chimed in that it IS about the principle, when you compare it all in US dollar terms, I’m still paying only $15US/night for a Hainan High Season Hotel! And I can relax a bit for the next 10 days and not have to worry about trudging through the streets of China with my suitcase and back-pack, as crowds look on and point….under the fireworks and moonlit night sky of New Year’s eve in China! But, come February 11, the adventure shall continue! p.s. Tonight, I’ll do something I don’t normally do. If you know me, I don’t typically buy into these “arbitrary lines” of this day or that day. However, tonight, as I spend New Year’s eve on the island of Hainan, People’s Republic of China, I shall head out into the maddening crowd and participate in the festivities! Stay tuned. p.p.s. I have no internet access, but….the universe is perfect. In ten days I can accomplish quite a lot without the distraction of constantly checking website stats, and email! Anyway, I’m currently staying at the Lost Youth Hostel. 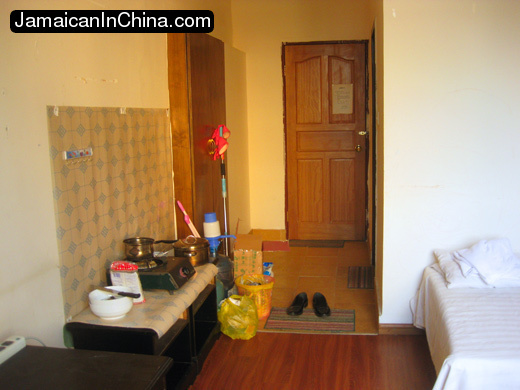 I’m currently paying 120RMB/night. It’s a nice place, friendly staff, piping hot water, and internet access. (No kitchen, but you know how I roll with the CPC!) I would stay here indefinitely, but on Feb 1st, I must leave because my room was booked in advance by others who planned to be here in Sanya with a bit more foresight than I had. 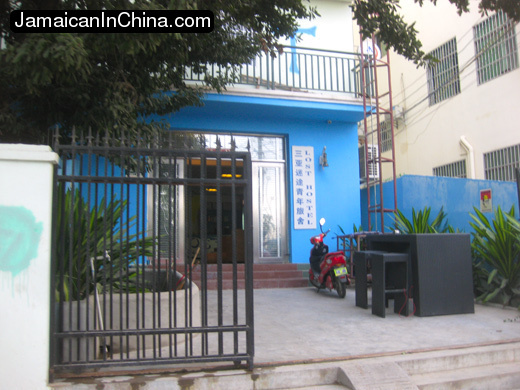 I also have to leave because on Feb 1, the rates go up from 120RMB/night (18US) to 450RMB/night (68US). That’s right, four times! Quadrupled! But, again, there are no rooms available anyway, even if I was desperate enough to pay that price. So, soon to be homeless, I’ve been looking for a new place around the island. Here’s how it works. 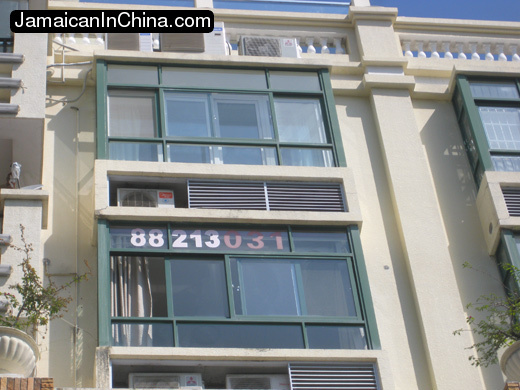 You walk around the neighborhood you’re interested in, look up at the buildings, and you’ll see typically huge orange banners with phone numbers on the balconies of specific apartments/rooms that are available for rent. They’re everywhere. You call the number, and…if you’re Chinese, you get one price. 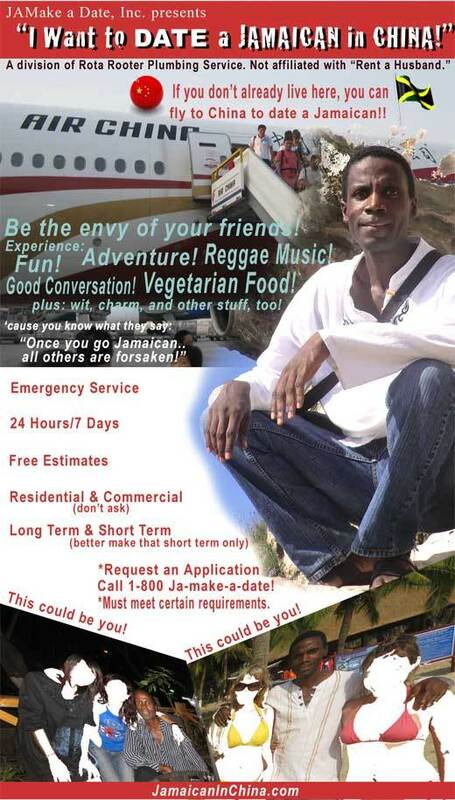 If you’re a foreigner, you get quoted another price. But, to be fair, while foreigners are, in fact, singled out to pay more (I hear the Swedes have it the worst), everyone, Chinese included, are paying “high season” prices to ring in the new year on Hainan. I’ve been looking and asking for a 30-day deal and a kitchen. 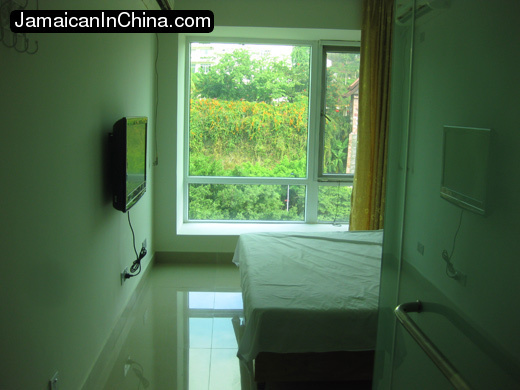 Because it’s the high season, I’ve gotten quotes of 3,500RMB/month ($530US) and as high as 9,000RMB/month ($1,363US) for a single room. I was paying $250US/month for my studio on Saipan, but that’s another story. 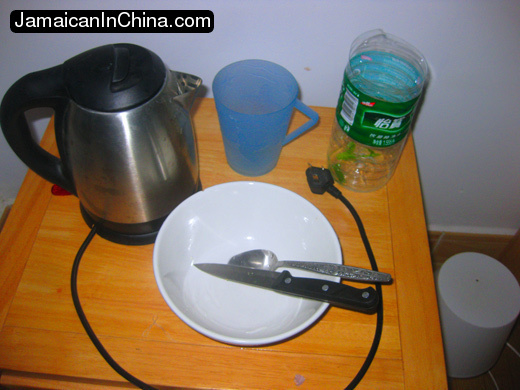 It’s just a room and a hot plate, but she wants 4,000RMB for 30 days. Someone will pay it. It just won’t be me. While on the bus on my way to check out the 3500RMB apartment, I met Wang, who was nice enough to call the landlord on my behalf, help me find the place, and help me gain entrance by communicating with the current tenants who were inside. 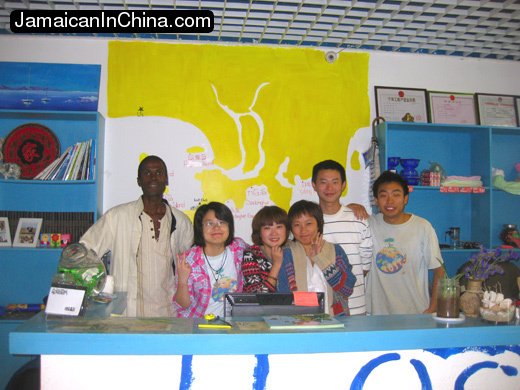 Helpful Hainan! The other reason I’m realizing I don’t want to commit to 30 days is this: In about 10 days, this will all be over. 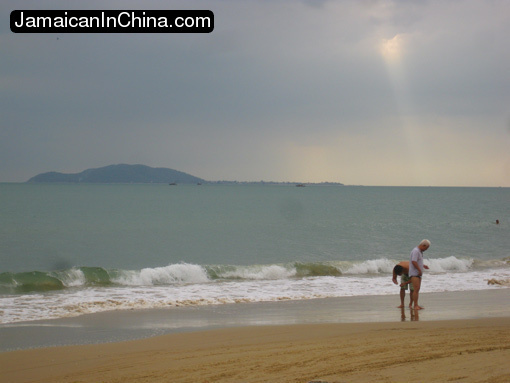 By about Feb 10, the festivities will be over, all the tourists will leave Hainan (except for a few stragglers like me), and prices will return to normal. Any deal I commit to now will be based on the high season prices. Why should I lock myself into paying 120RMB/day, for instance, and then continue to pay that rate once Feb 10 has passed? So, the new plan is, I’ll figure out a way to survive until Feb 10, and then I’ll approach some of the same owners anew to renegotiate based on the “not-so-high season” hysteria. So, today I went back to a part of town where I had found a hotel at which I had been quoted 80RMB/night, and found out that they now wanted 200RMB/night! I walked out. Someone will pay it. And then, it happened. A few hundred hards further down the street, I walked into a nice establishment, and there was a 15 year old kid at the desk! Jackpot! I knew what was about to happen. I mimed for him to show me a room. He did. I asked him the price. He said 60RMB/night. I tried to contain my excitement. He was a naive, wide-eyed kid, and I was likely the first Jamaican he had ever encountered (trust me, I can tell), and I knew for a fact he was quoting me the “Chinese price.” Given the rarity of seeing a foreigner hotel-searching in this part of town, Mom and dad likely hadn’t forced Junior to read the part of the training manual entitled “How to Make a Killing Selling to Foreigners.” I accepted, and paid for 7 days. 420RMB for 7 days. He gave me the key, and I told him I’d check in tomorrow. 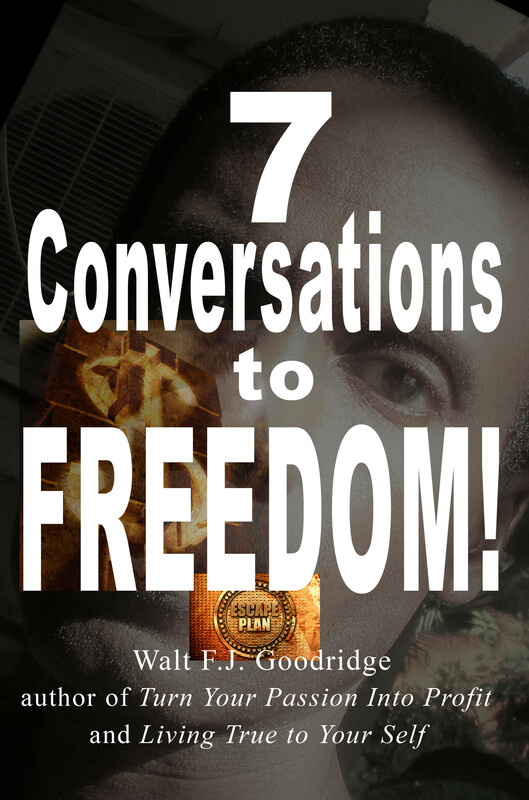 He didn’t ask for it, but I left him my cell phone number because, even though I now had my receipt and the key, I knew what would happen the moment I left and the boss (mom or dad) found out what he had done! Sure enough, about an hour later, once I return to the Lost Hostel, I get that phone call. It’s from an adult at the hotel where the 15-year old rented me the room. Turns out that the price on Feb 3rd is going to go up to 200RMB. 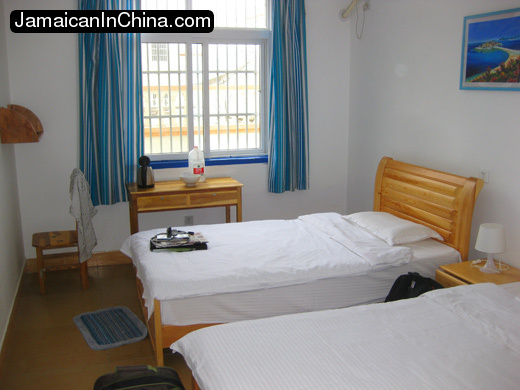 But, I will get Feb 1 and Feb 2 at 60RMB/night! What a steal! 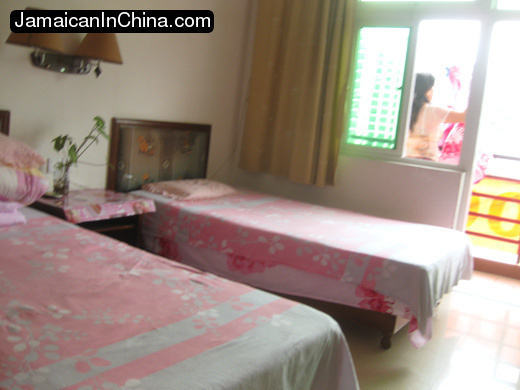 So, tomorrow, I check out of Lost Hostel, and check in to a great 60RMB/night room on HighNan…I mean Hainan! Stay tuned, I’m sure this story will get even better. p.s. Now, I know what you’re thinking: I took advantage of a minor. Well, the way I see it, I took the opportunity to get the money in their hands. With a paid customer, this close to the new year, I figure they have two options. (1) They could give me back my money (possible, but unlikely, given that as I’ve learned, putting the money directly into the hands of someone you’re negotiating with is great leverage. (2) They could honor at least a part of the agreement that Junior made (which they now have done), and attempt to extort me for more money after the first 2 days is up (which they are already preparing me for). I’m sure they feel THEY have some leverage once I move in. However, the way I see it, is that I’VE got more leverage cause I’m not afraid to move out and sleep on the beach if I have to to make a point. Recipes from the Coffeepot Cookbook! Addendum March 5, 2011: Great news! 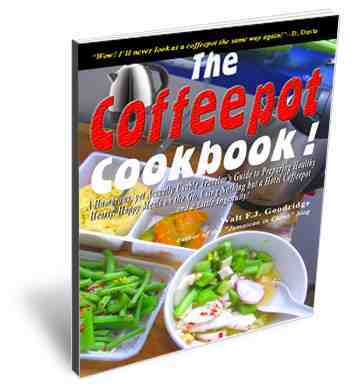 There’s actually now a Real Coffeepot Cookbook, inspired by the blog post! Okay, there’s something you need to know about me for when we hang out together for the Jamaican in Russia adventure: I take my diet very seriously. At the same time, I’m not ruled by my gut, at least not the same way other folks are. So, when I say that I don’t eat meat, I don’t mean just for today. I mean yesterday, today, tomorrow, the next day, and the day after that. I’m not suddenly going to forget and take the piece of pork you’re offering me because YOU forgot that I don’t eat meat. (I had a hard time explaining that on a date in Xishuangbanna.) I’ve been vegan since 1992, so I mean never. It also means I don’t eat fish, because last time I checked, fish aren’t vegetables. When I say I’m fasting, I just don’t mean “just for right now,” and then proceed to take the rice you’re offering because it’s after 5pm. When I fast, it means I’m not eating. And when I say I don’t eat MSG, or meat flavoring cubes or white sugar or table salt, that’s just what I mean. So, today as I slowly resume eating from my fast, I felt like I wanted something warm rather than the fruits I’ve been eating for the past 2 days. However, for reasons I’ve just stated, I won’t eat in a non-vegan restaurant, because I can’t be 100% sure that even though I request no MSG, no salt, no meat oil, no eggs, etc. I can’t be sure that the chef will honor those requests to my satisfaction. So, even though there’s no kitchen in my hotel room I will still cook today, because I have…..wait for it….wait for it……The Coffee Pot Cookbook! 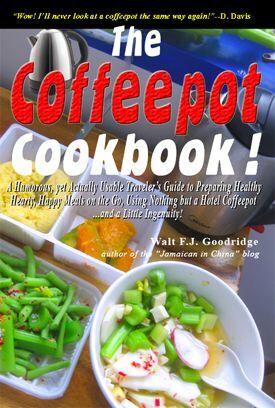 That’s right, ladies and gentlemen, The Coffee Pot Cookbook by Walt F.J. Goodridge, healthy meals you can make with just a coffee pot and a little creativity! I had the idea for this back in Kunming, but didn’t get around to blogging about it, so now it’s time. Today’s dish is Walt’s Nomad Veggie Soup and noodles from Chapter 7 of the cookbook. Before beginning the process below, If you’ve only got one bowl, you can pour hot water over dried rice noodles, let soften, remove from bowl, place in hotel teacup, and enjoy as a side dish or include in soup. 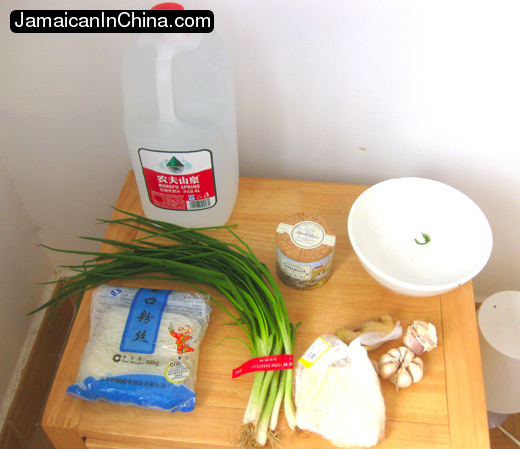 Wash bok choy, tofu and scallion with your bottled water. If no basin or pot is available, cut the top off a smaller empty 1.5L water bottle (shown) you’ve been saving in your room for just this sort of thing, insert vegetables, pour in water, cover with palm of hand and shake vigorously. Finely dice garlic, ginger and scallion. If no cutting board is available, spread a piece of plastic (the extras you got from the produce section of the supermarket) across the wooden desk of your hotel room. Dice gently, then discard the sheet when done. 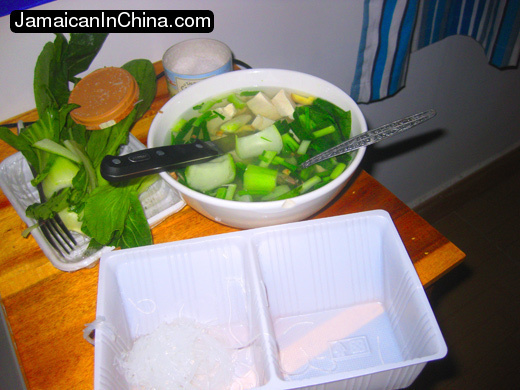 Place diced ingredients, tofu and bokchoy into soup bowl. Boil water in coffee pot. Pour boiling water over ingredients in bowl. Cover with plastic sheet or plate if you have one. Let simmer for a few minutes. Stir occasionally. Next time, we’ll make brown rice in a coffee pot. This could get messy.